Poli noted a change in the Pole Shift ning blog where he posts photos of Nibiru at dusk almost daily, captured from an Italian webcam. Poli noted that Planet X, aka Nibiru was now visible for a longer period of time, a full hour. And indeed it was. Note that the setting Sun moves along the Ecliptic at that time of day, as seen from Italy, so that the Sun moves slight from left to right as it drops below the horizon. 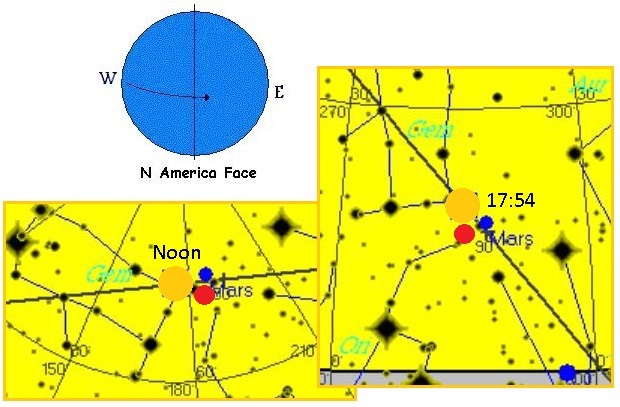 The slant of the Ecliptic is lower left to upper right at dawn from that location, becoming a straight line across the sky at noon, and then slants from upper left to lower right at dusk. But why does Nibiru seem to move from under and slightly to the right of the Sun, then moving under and more centered under the Sun as the hour progresses? The daily Earth wobble has the globe dropping the Ecliptic, in what is called the bounce back, when the Sun is centered over the Americas. The Sun is thus somewhat further to the South than Skymap expects. 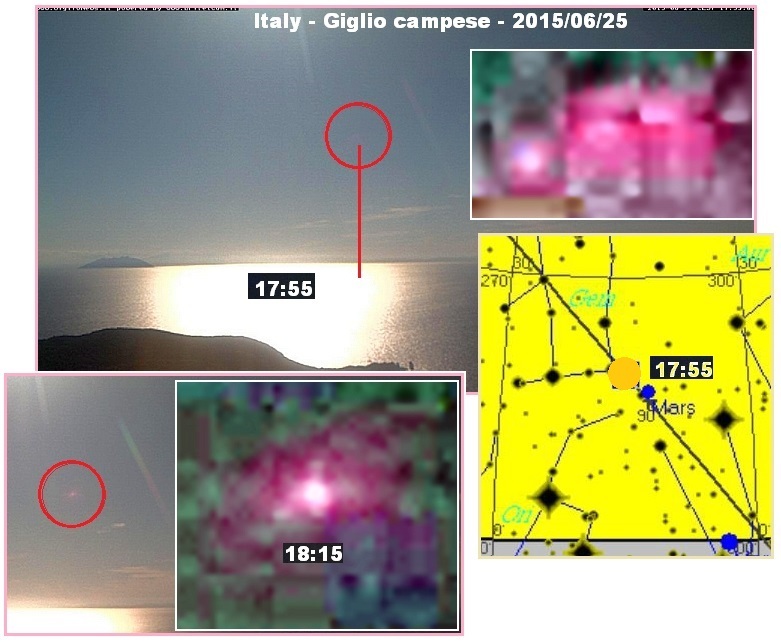 Thus the view from Italy is instead increasingly along the Ecliptic at that time, and Nibiru is close to the Ecliptic. The view thus is first Nibiru, and further behind Nibiru along the Ecliptic, the Sun, in a straight line of sight. 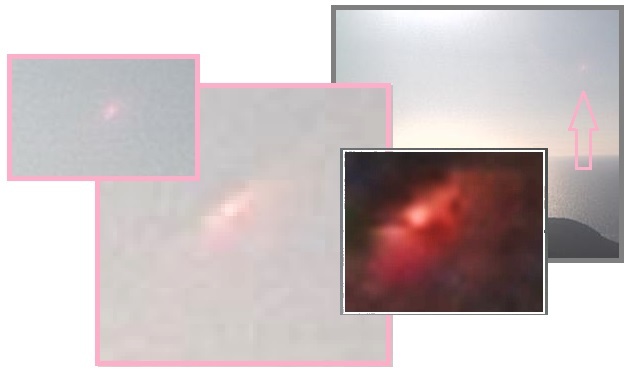 These dramatic captures of Nibiru daily were first discussed in this newsletter in Issue 440 on March 8, 2015 when the obvious double helix, a hallmark of Nibiru, was regularly being captured. 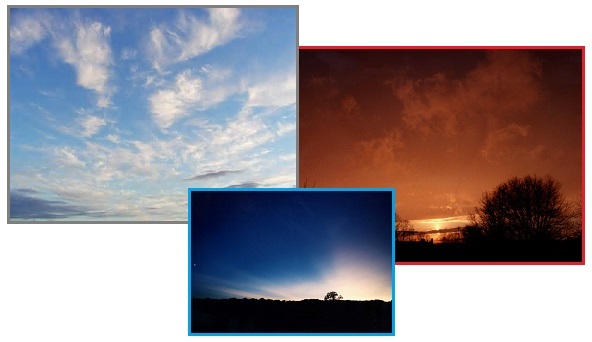 These captures were featured again in Issue 447 on April 26, 2015 to discuss why Nibiru can be seen through the wispy sunset clouds, which always appear darker and thicker on the horizon than they are. ZetaTalk Comment 4/11/2015: These Italy webcam images are taken at dusk, and clouds in the distance at these times appear more dense than they in fact are. They are wispy. The darkness at sunset in distant clouds is due to the lack of white light bouncing around in the clouds, but they are thin, wispy. More evidence of Nibiru lies in evidence of the Earth wobble, which has been present since 2004 after Nibiru entered the inner solar system in 2003. Lately, as Nibiru heads outbound from the Sun and toward the hapless Earth caught before it, the wobble has worsened. The Earth wobble can be determined by measuring where the Sun rises and sets, the Azimuth. For instance, if the Sun was anticipated to be at Azimuth 143° at sunup in St. Petersburg on January 13, 2009 but is found at Azimuth 180°, a full 37° too far south, this is due to the wobble. I, Nancy, tracked these readings for years after the wobble emerged in 2004, from dozens of trusted team members around the world. This is how the Figure 8 of the Earth wobble was determined. But careful Azimuth readings require a firm understanding of North and South from one’s vantage point, as the compass is no longer reliable. During the day, when people are out and about, Polaris is not visible. Old surveys with true North marked can be a guide. What does grab the attention of the public is having the Sun begin to rise at 1:00 am when it is not due to rise until 4:09 am. The Inuit have noted for years that the Sun and constellations are not in the right place. Their words cannot be discounted as they live in the Arctic where light pollution from city lights is not a distraction and the stars are used for navigation. Elders across Nunavut have noticed that the sun and stars have changed their position in the sky. The sun is now rising higher and staying longer than it used to. Importantly, in the far north, you must remember that the sun goes below the horizon for a large part of the year, and therefore Inuit are very familiar with its celestial pattern. Indeed, Inuit we're talking with are telling us stories about how in the old days, during the dark months, they would travel the land by dog team using stars as their navigational tools. So, when Inuit talk about the sun and stars, they do so with an intimate knowledge of these systems. The people of Lysekil, Sweden did a double take on June 23, 2015 when the sky lit up like dawn at 1:00 am. This light was beyond the civil twilight that makes the outline of object visible the hour before dawn. In any case, civil twilight should only be present the hour before sunrise, and sunrise was not scheduled to occur until 4:09 am. The cam at Lysekil was pointing North. Folks in Denmark, nearby, also reported that this early sunrise light is occurring. This is not the land of the Midnight Sun! 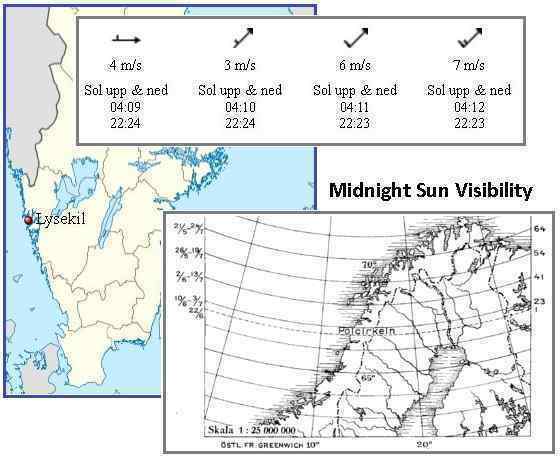 Can zeta give an answer why the sky is lit in the middle off the night at 1am, the camera is pointing North and is located in Lysekil, Sweden, latitude 58.2833° N. I have a friend that lives in Sweden and confirm this event. If is the wobble, Can we get an insight how big the wobble get, a measure? The midnight sun is a natural phenomenon that occurs in the local summer months in places north of the Arctic Circle or south of the Antarctic Circle, when the sun remains visible at the local midnight. Around the summer solstice (approximately June 21 in the north and December 22 in the south) the sun is visible for the full 24 hours, given fair weather. Although approximately defined by the polar circles, in practice the midnight sun can be seen as much as 90 km outside the polar circle. Even the northern extremities of Scotland (and those places on similar latitudes such as St. Petersburg) experience twilight in the northern sky at around the summer solstice. So how far has the wobble wobbled for this to occur in Lysekil? If the residents are not into reading Azimuth to determine where the wobble had pointed them, then perhaps researching twilight expectations can help. The light from Lysekil is clearly at a civil twilight, if not brighter than this. Civil twilight is present the hour before sunrise, and would require a 6° rotation turn to arrive where the sunball is visible above the horizon. Per the Zetas, this is proof of the wobble, as the North Pole would be leaning somewhat toward the East at this time of night for Lysekil, thus avoiding the landmass of the fat Equator which would otherwise obstruct the view. Civil twilight can also be described as the limit at which twilight illumination is sufficient, under clear weather conditions, for terrestrial objects to be clearly distinguished; at the beginning of morning civil twilight, or end of evening civil twilight, the horizon is clearly defined and the brightest stars are visible under clear atmospheric conditions. 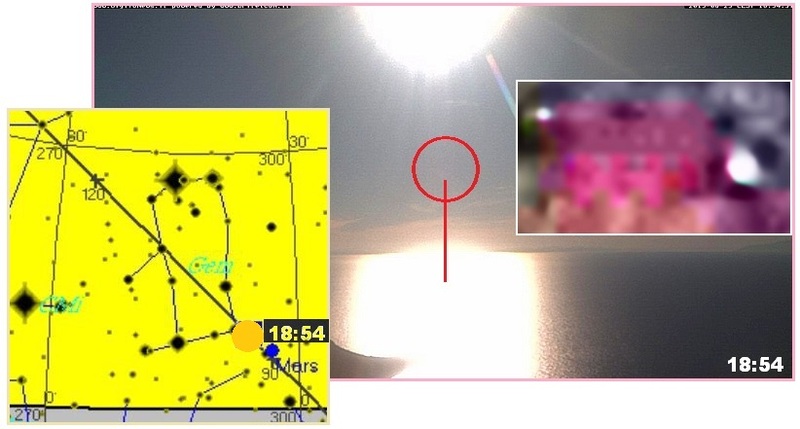 ZetaTalk Insight 6/27/2015: Twilight, when the sky is somewhat lit before the Sun rises or sets at Dawn or Dusk, is visible 18 degrees from those lands where the sunball is visible. 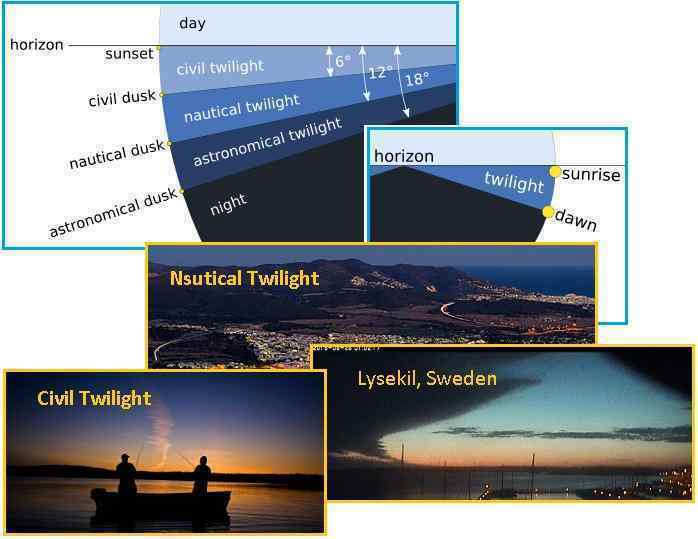 Twilight is divided into 3 phases, with only civil twilight with any degree of brightness. This stands at 6 degrees from lands where the sunball is visible. The image captured in Lysekil is beyond civil twilight, and thus is not caused by the Summer Solstice and the proximity to the Arctic. The Sun was not expected to rise there until 4:09 am, and civil twilight is not expected until an hour before the Sun rises. This photo was captured at 1:00 am. This is most certainly wobble related, as the globe is tilting its N Pole somewhat to the East at this time, into the rising Sun. 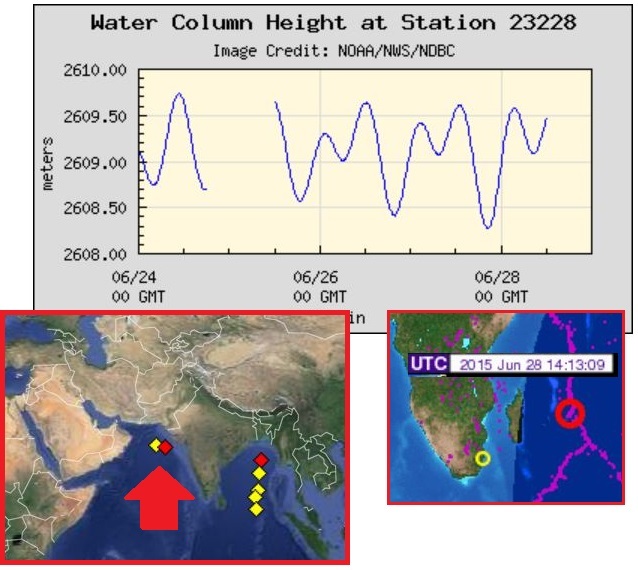 The African Roll has barely started, but the continent is clearly restless from the stress of plate pressure on all sides, as this Pole Shift ning blog shows. The Atlantic is pulling apart, encouraging the solid continent of Africa to shift and drop into the void opened up in the Indian Ocean. This is tugging at the plate border that runs through the Mediterranean. The Zetas predicted that the 7 of 10 plate movements would result in Gibraltar pulled apart by an additional 125 miles and the Sinai peninsula separated from the mainland by a total of 50 miles. Africa may be under stress, but these measures have not yet occurred when the Modis satellite images are examined. We’ve got a long way to go on the African roll. ZetaTalk Prediction 12/4/2010: The Straits of Gibraltar will open an additional 125 miles and the northern point at Morocco will move 50 miles further east. All points around the northern border of Africa will move commensurately. 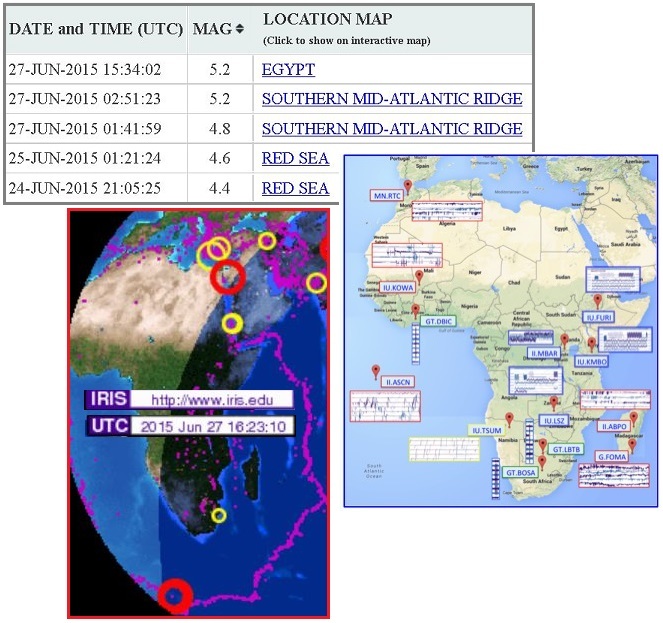 Signs of African Plate movement, such as quakes along the plate border or buoy alerts, will increasingly be evident. The African Plate is on the move! 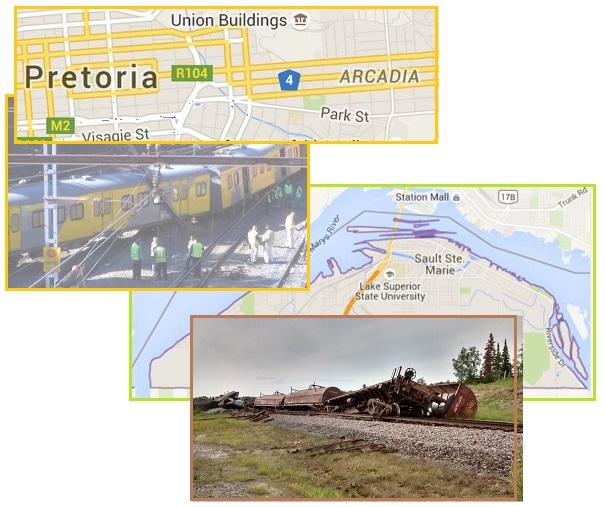 What is causing the increase in train derailments? The Zetas point to the shifting ground, where rock layers are pulled apart or shifted due to plate movement. River bottoms are particularly susceptible to this tugging as rivers run where the crust is thin and sags. 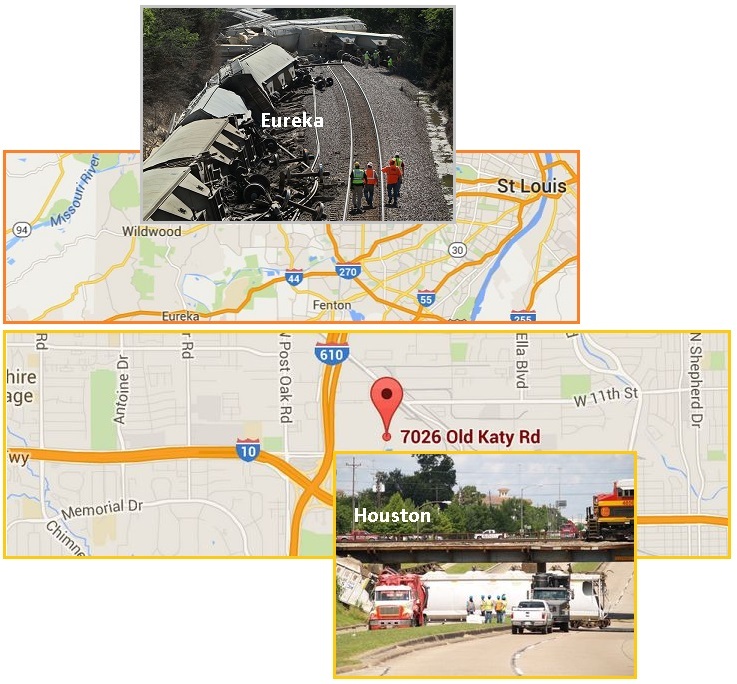 The degree to which train tracks are twisted ahead of derailments is not always admitted, accidents going “under investigation” with the results never disclosed, but one particular accident just west of Chicago clearly showed the reason. The tracks in the train’s path are anything but straight! 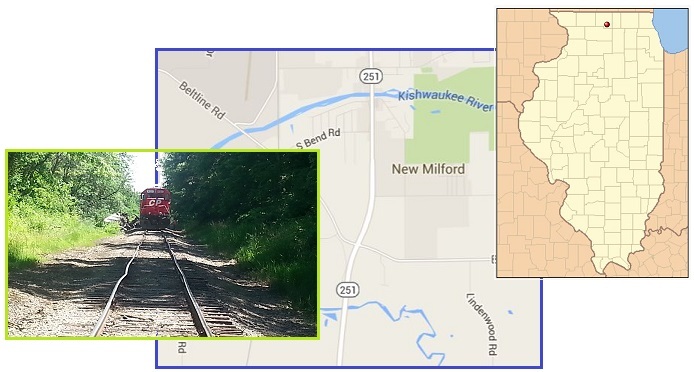 The Winnebago County Sheriff's Department is responding to a reported train derailment in New Milford. No injuries were reported when four out of five cars on a Canadian Pacific Freight train derailed around two this afternoon. Four of five cars went off the track near Baxter Road Crossing. ZetaTalk Prediction 4/9/2011: We have frequently mentioned that Chicago will suffer during the coming New Madrid adjustment and again during the coming pole shift. The rock under Chicago will lose support, pulling apart and dropping during the New Madrid adjustment, creating the implosions we have predicted for some cities when the infrastructure drops. Chicago did not suffer during the last great quake on the New Madrid fault line in 1811, and thus the residents may be smug about the coming adjustment. An examination of trail derailments recording in the Pole Shift ning blog dedicated to this subject, in the first two weeks of June, show that derailments almost invariably happen along rivers - Memphis on the Mississippi River on June 1, London along the Thames River on June 3, along the rivers that snake to the sea on the Borneo coastline on June 8, Eureka just outside St. Louis on the Missouri River and itself along a feeder river on June 9, between two rivers in Houston which is itself on the Gulf on June 11, in Pretoria along a river on June 15, and along the St. Mary river joining the Great Lakes at Sault St. Marie in Ontario on June 17. Seven cars derailed as they were pulling into the BNSF rail yard on Shelby Drive around 7:00 am. Crews are working to clean it up and investigators are working to figure out what caused it. Network Rail said three wagons on an empty freight train derailed as it made its way from sidings at Angerstein Wharf onto the railway from Greenwich to Charlton. An investigation has begun into the causes of the derailment. 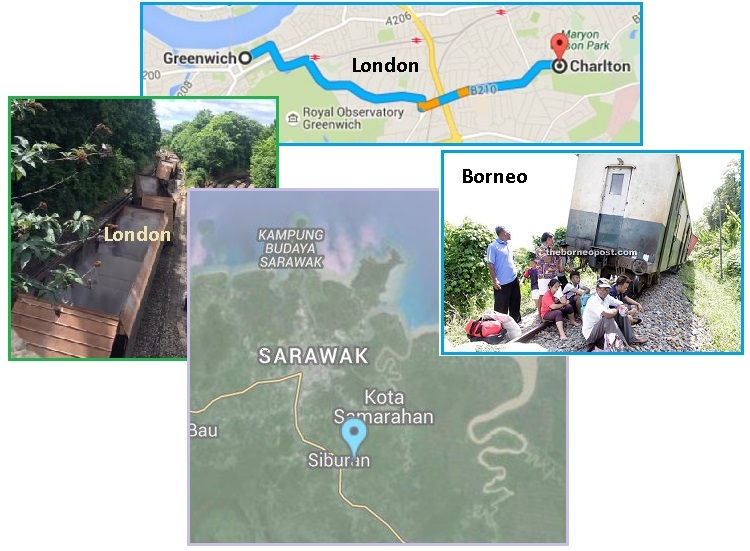 A four-carriage passenger train with about 50 passengers derailed near Kampung Batu 60, near here yesterday, forcing the State Railway Department to temporarily stop train services between the Beaufort-Tenom route. The department was still investigating the actual cause of the accident. Railroad employees look over the wreckage from a train derailment close to Lewis Road and the Crescent Farms Golf Club near Eureka. The cause of the train’s derailment is currently under investigation. Once the trains have been pulled out, we’ll start doing measurements and inspections and scans of the track and the wheels of the cars involved. About four hours after the accident, crews had removed the cars that were upright on the track and a locomotive was able to pull them away. There is no history of problems at this junction. The train was travelling from Pretoria towards Park Station when the last two cabins derailed. Metrorail is still investigating the accident. The train that derailed Saturday, near the intersection of Municipal Road 4 and Bay Street, was carrying large steel coils. It was headed east, from Sault Ste. Marie toward Sudbury. There have been many launch accidents during the recent Council of World’s war with the elite, for many reasons. The Council slaps the hands of the elite when they attempt to launch spy satellites that will allow the elite to control migration or locate survival camps, as they have done for Russian launches in April and May, 2015. The Council smacks down launch attempts when the elite brag about how they will go to Mars, as they have with the failures of Elon Musk’s Falcon 9 reusable rocket attempts since 2014. The Council also uses launch failures to punish the elite for blocking Obama’s announcement plans, as they did in October, 2014 when Sir Richard Brandon’s Orbital Sciences launch failed. 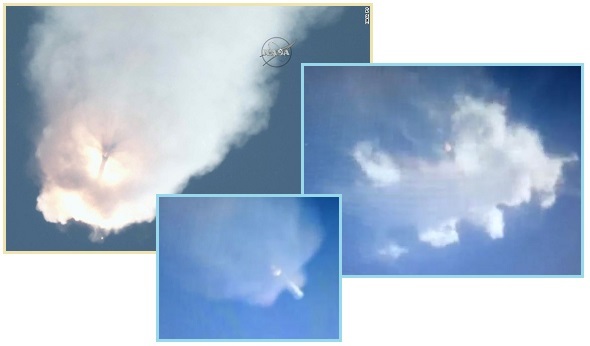 So after Space X made several successful re-supply missions to the ISS, what was the reason for the dramatic explosion during a Space X launch on June 28, 2015? SpaceX -- which is headed by Musk -- has made seven trips to the ISS under a contract the company has with NASA. It is the first company to complete a return trip to the space station, a feat previously achieved by only governments. The failed cargo flight was carrying more than 2 tons of supplies, including 1,500 pounds of food and provisions for the crew aboard the space station. Current supplies should last for several months and resupply flights by other operators are scheduled in coming months. In late April, Russia had to abandon a trip to the ISS after its spacecraft carrying 3 tons of cargo lost control. And last October, a cargo spacecraft developed by Orbital Sciences destined for the ISS exploded just after the company was awarded a $1.9 billion contract with NASA. 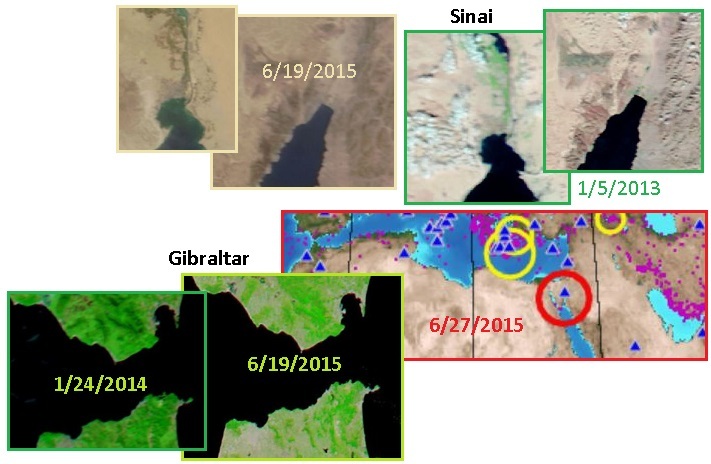 ZetaTalk Insight 7/4/2015: What is the message here? As with other failed launches, this most recent failure is a definitive message from the Council of Worlds. Space X has had success in resupplying the ISS, though has flounded on landing on a floating ocean platform. Resupply of the ISS is OK, reuse of their launch equipment so as to help the elite escape, not OK. The message now is that the elite should not expect to get into space at all. No escape. The message here is to take all hope away from such plans among the elite. They are to remain on Earth with the common man. We expect the battle to shift from attempts to block the announcement, or deny its meaning, to attempts to enslave the common man in some way. That is another fight, on another day. What of the ISS, which for today does not get its fresh supplies? The ISS has an escape pod for the astronauts on board, who can leave by this route whenever they choose. The ISS has been used for space based studies, which was to assist the elite during future travels to Mars or the Moon. What can survive in space? What is the effect of low gravity on life? None of these studies benefits the common man on Earth, nor was it intended to do so. Since man, in his present form, and in his present immature spiritual development would not be allowed to travel in space, the ISS is irrelevant. It is best it be closed down, and the astronauts returned safely to Earth.